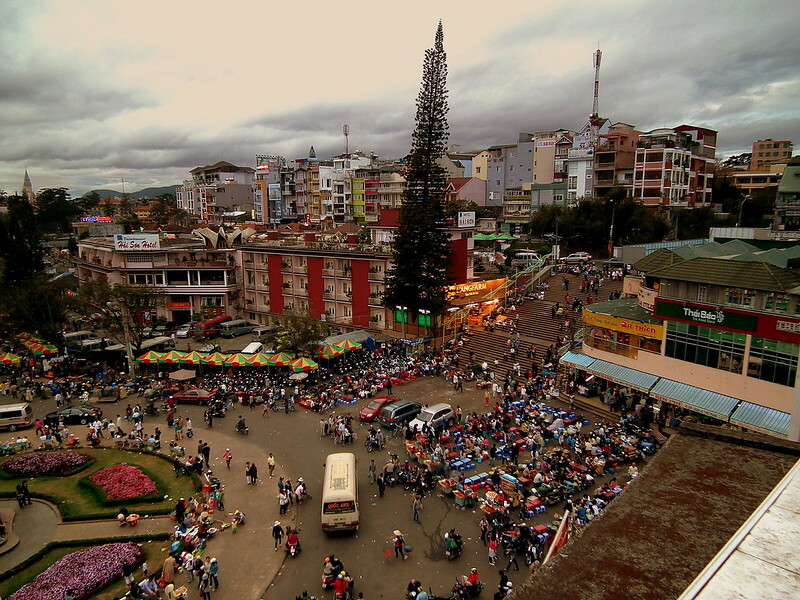 We left Mui Ne on a small bus and headed to Dalat, a city in the Highlands region of Vietnam. Lying on the hills and surrounding Ho Xuan Hurong Lake, its climate differs from the otherwise tropical climate of Vietnam—the lower temperatures and humidity gave it the name of the “City of Eternal Spring” or how the French used to call it “Petit Paris”. If going uphill in an old car may be difficult, it’s harder when you do it on an overheated-prehistoric minibus with no leg space. The minibus had air conditioning, it just had to be turned off during 95% of the ride, otherwise, the bus wouldn’t go up. The trip took around 4 hours through twisting roads and cars overtaking us like in an action movie. On the bright side, the landscape grew greener as pine trees started covering the hills. Up there, coffee plantations and strawberries greenhouses substituted the dragon fruit plains of the lowlands. The bus stopped at the door of the Au Phu travel agency in the city center. Apparently, all tourist buses stop here, so as usual, taxi and bike drivers awaited. On our 3-day stay in Dalat we rented two mountain bikes at Groovy Gecko Adventure for €3.30 each, for half a day. It was the best deal we found in the city and the bikes were pretty good. The first day we pedal for 40 minutes to the Linh Phuoc Pagoda—a complex of temples different from what we had seen so far. 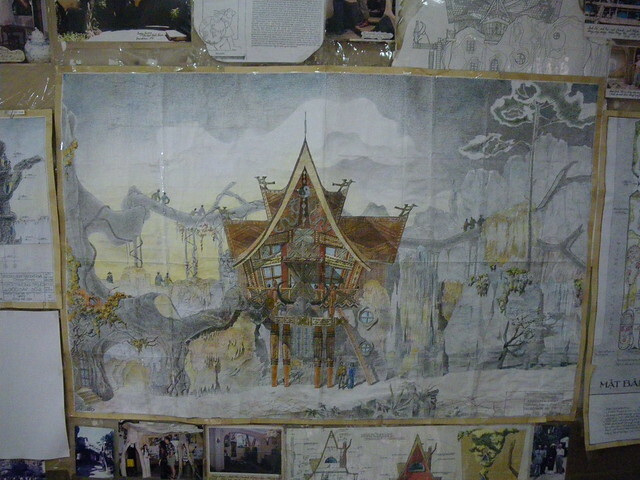 The decoration was of Chinese inspiration, more figurative, detailed and adorned with pieces of colored tiles. There are towers to climb, giant statues of gods and goddesses, wax monk figures and winding glaze dragons to see. 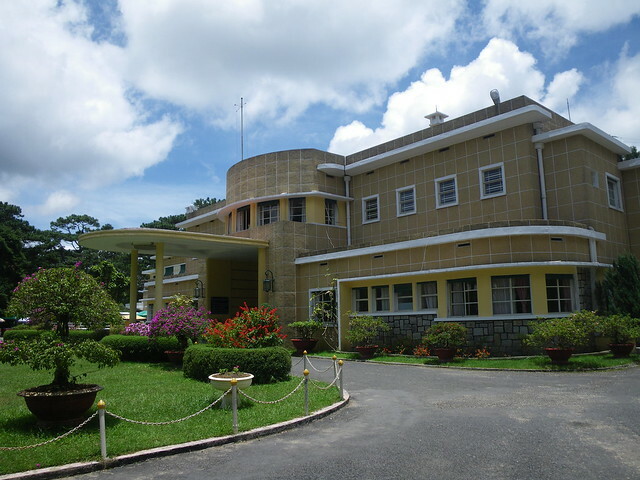 Unfortunately, we weren’t allowed inside the main hall because we were in shorts, so take that into consideration before you go. You can grab something to eat at the restaurant inside the complex for little money. They sell dumpling soup, soda, fruit and ice cream. 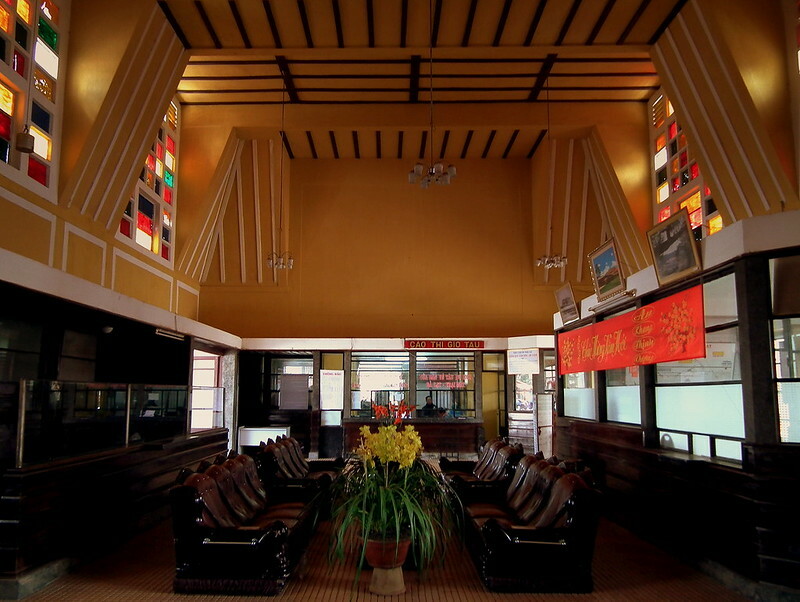 On our way back to Dalat we stopped by the Crémaillère Railway Station, an art-deco building from the 30’s that these days only operates a 7 km trip, connecting Dalat to the village of Trại Mát. Later on, we biked to the Xuan Huong Lake in the city center and rested our legs in the grass while watching the sunset. 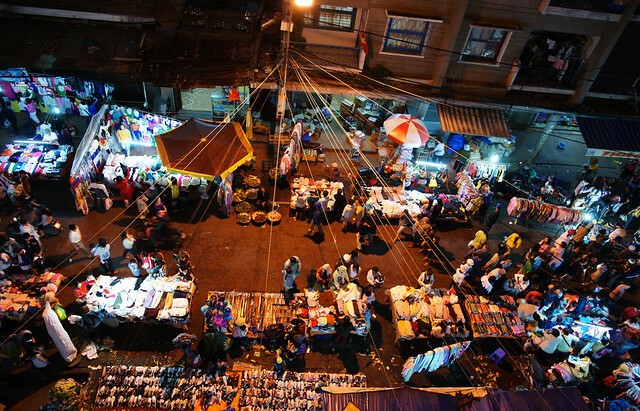 As the night begun to set, the central square transformed into a proper Asian night market. The streets came alive with hundreds of people captivated by neon lights from restaurants and street food stalls, and by the perfect piles of fruits, cheap clothes, and knick-knacks. 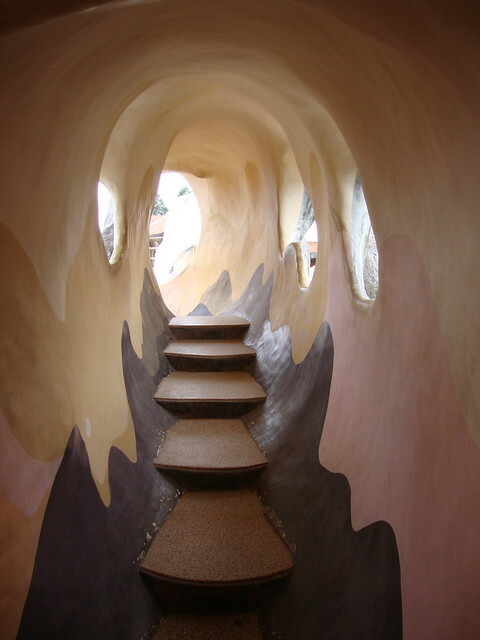 The next day we visited the Hang Nga or ‘Crazy House’, the bizarre private home of an imaginative architect that is now a hotel and a tourist attraction. The house keeps augmenting to follow the plans of its creator, financed by the revenue generated by tickets sales: €1.64 for one person. Further up the mountain in the middle of a pine tree forest is the Bao Dai Summer Palace, one of the residences of the last king of feudal Vietnam. The entrance fee was €0.62 (plus an additional fee if you want to take photos), and it grants you access to the 52 rooms of the palace. It was fascinating to see the home of the royal family, their objects, and portraits on the walls. The visit ended in the downstairs kitchen and through a gift shop full of generic souvenirs. We kept pedaling to the Truc Lam Pagoda, a delightful Buddhist monastery amid pine trees and gardens in pristine conditions. The pagoda is maintained by monks and nuns that reside there. We spent a good hour staring at the lake and the surrounding mountains. There was a scent of incense in the air and big metal wind chimes ringing in the breeze. You can’t get more ZEN than this, it was beautiful! On the third day, we only had the chance to visit the Thien Vien Van Hanh pagoda in the morning. The rest of the day was spent at a cafe drinking hot tea while it rained like crazy. It was a big tropical storm that lasted all afternoon and flooded our hotel room. Here in Dalat, we ate several things for the first time. Like this flat pizza/crepe hybrid, with egg, sausage, and chives sold in the central square at night. It was late at night and we couldn’t find a place to eat that looked “trustworthy”. Eventually, we passed by a restaurant with people cooking at the forefront: sausages, fried eggs, coriander and sizzling meat. Table for two, please! The restaurant Bò Né 3 Ngon was dripping oil from the walls and the floor was a slippery slide. Not one word on the menu was written in English and no one from the staff spoke it. When we asked them a question, they pointed to the menu on the wall (same menu we had on our hands but with bigger letters). We shrugged and ordered a “Number 2” because the restaurant smelled delicious and we like surprises. Nuno and I are big bread lovers and luckily, Dalat has several bakeries, most of them doubling up as restaurants. They have a huge selection of bread and other baked goods, all super affordable. 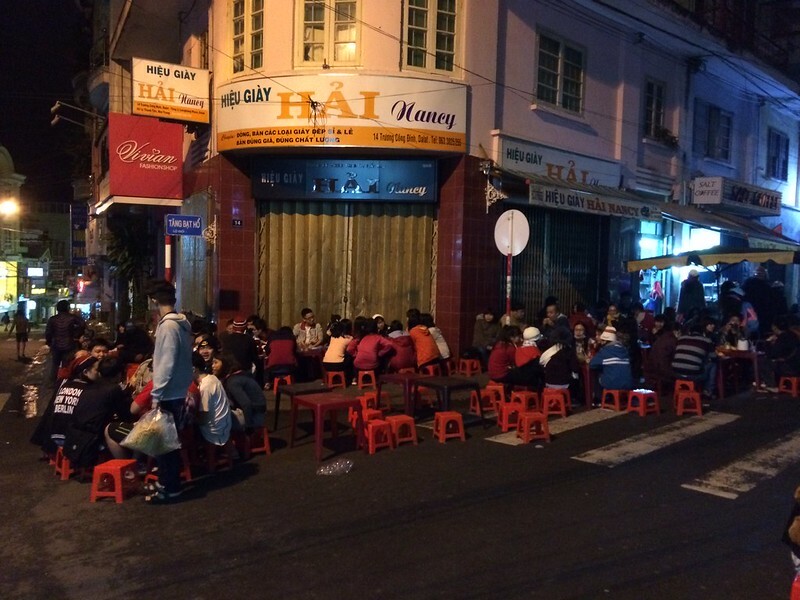 One night walking around secondary streets, we noticed some locals gathering near a food stall, sitting on the characteristic tiny Vietnamese chairs. It smelled sweet so we curiously approached the stall. Behind it, a Vietnamese lady was selling assorted fried dough cakes and different kinds of warm milk. You can pick 3 or 4 cakes and one glass of milk, sit down on the tiny plastic chairs and eat. If you’re visiting Vietnam and need to freshen up from the heat of the lowlands, climb the mountain and check this friendly city. If you have any questions or some extra info everybody can benefit from, please leave it in the comments below!